What happens when you find yourself more focused on helping your friends and others than focusing on yourself? What happens when your kids start to grow up and they don't rely on you the same way? Both of these questions came to mind while I was reading Here, Home, Hope by Kaira Rouda. The story follows "one woman's courageous journey through midlife crisis and personal reinvention." Kelly Mills Johnson is thirty-nine years old and as they are each summer, her kids are away at summer camp. A combination of her age (and those of her children) and a recent cancer scare has her using this time to contemplate on her life. As she thinks about things, she finds many things that she wants to change in her life and she starts to write Post-It notes with Things to Change (T2C). Some of them are straight-forward, like T2C #17: Learn Yoga and some require a lot of effort like T2C #4: Don't compare yourself to others. "Kelly Mills Johnson becomes restless in her thirty-ninth year. An appetite for more forces her to take stock of her ordinary middle-American existence and her neighbors’ seemingly perfect lives. Her marriage to a successful attorney has settled into a comfortable routine, and being the mother of two adorable sons has been rewarding but exhausting. Meanwhile, Kelly’s own passions lie wasted. She eyes with envy the lives of her two best friends, Kathryn and Charlotte, both beautiful, successful businesswomen who seem to have it all. Kelly takes charge of her life, devising a midlife makeover plan." The story-telling was wonderful. I found myself laughing and crying as I read the book. The chapters were the perfect length for me to continuously justify just one more chapter before I ___. (you can fill in the blank with just about anything - go to sleep, switch the laundry, do the dishes) In addition, I found myself really connecting with Kelly. I see in her things that I see in me. I feel like I am someone that puts every one's needs in front of mine. (In my opinion), I am a good listener and someone that my friends can and do turn to in their time of need, but am not sure that I would do a good job of turning to someone. As Kelly spoke of her ritual of avoiding being noticed/recognized when visiting a psychologist, I could see myself acting in a similar fashion - okay with seeking help, but not wanting everyone to know it. I have my own collection of T2C, but I have to remind myself to put my needs first. Maybe writing them down and posting them around the house would help me. Like eating right and working out...I can do it and I can succeed, as long as I don't let "life" get in the way of achieving my goals of a healthier life and smaller clothes. You'll have to read the story for yourself to find out what she learns along her journey to reinvent herself, sharing the outcome of the story just wouldn't be fair to you! Want to learn more about both the book and Kaira Rouda? You can find a video trailer for the book here. You can find Kaira on her website, on Twitter and on Facebook. She seems to be very accessible - she is in the midst of a book tour and even offers to Skype into your book club meeting, if she is available. One A Busy Mom of Two reader has the chance to receive an autographed, copy of Here, Home, Hope by Kaira Rouda. To enter, leave a comment with an answer to this question: Who is your favorite author? Share this giveaway with friends - on your blog, on Facebook or by e-mail or by posting it on a giveaway link-up. Leave me a comment letting me know how you shared or leave a link to the giveaway link-up. You may have one additional entry for each give-away linky that you submit it on. Giveaway will remain open until June 16th at 6 pm. One winner will be selected using a random number generator. The winner will be contacted by e-mail (be sure to leave one!) and will have 48 hours to respond or a new winner will be selected. I received no compensation for this post. I received a copy of Here, Home, Hope through One2One to read and review. In addition, they are providing the book for the giveaway. 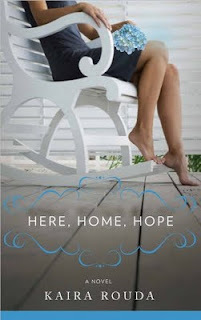 Thank you so much for your wonderful review of HERE, HOME, HOPE! It's so great when the story resonates with a reader. It's hard to explain how much that means to a debut novelist! Thank you, again, so much! Have a wonderful day and good luck to everyone who enters the giveaway! My favorite author is Margaret Atwood. I am a GFC follower and subscribe via email. Thanks for the giveaway! I would love to read this! Wow! A comment from the author herself! That's awesome! It sounds like a wonderful, heart-felt story that many women could relate to. I don't have a favorite author; anyone that can touch me with their story is great in my book! One of my favorite authors is John Sanford! One of my very favorite authors is Alice Hoffman. Great review! I've heard so many good things about this book, I can't wait to read it, and would love to own a signed copy! My favorite author (easy to see if you look at my bookcases) is Stephen King. It started with a love for the macabre, but grew into an appreciation for his writing style. ...and I've followed A Busy Mom of Two on Twitter. And I'm a GFC follower & just signed up to follow via email! I do not have a favorite author. Just love reading! I follow via GFC and I also subscribed via email. Just read Cutting For Stone by Abraham Verghese...but any book I read that's wonderful becomes my favorite book & author! First, thank you for the chance to win Kaira's novel; its currently on my must read list. Now my favorite author has to be Wally Lamb. She's Come Undone is my all time favorite book. I follow Kaira on twitter. I follow Busy Mom of 2 on twitter. Opps...that was supposed to be a seperate comment. I like so many author's but top of my list most days is Nicholas Sparks!! Love his books/writing style/hearwarming stories! My favorite author is probably C.S. Lewis. Not who many would pick, but there is personal meaning behind it. I could also give you a long list of mainstream authors but I had to go with my heart on this one. My fav. author is Lisa Samson!! I follow you on GFC as Ramblesahm.